Welcome, people. Please take an available seat as soon as possible so we can start this presentation. Dr. Jensen, a pleasure. Didn't know you were interested in this. Dr. Thissle. Miss Trynch, good morning. Nice to see you here. Hello there. I think we still have some empty seats, yes. No no, that's fine, come in. Right. Could you close the doors, Ian? Thank you." Now then, welcome to the Orientation on ГРУ, Отдел 'П', or as we refer to it: GRU Division Psychotronics, GRU Division "P" or GRU-P. I know many of you are only here because you need to attend a certain amount of seminars each year and you're looking for a nice quiet one where you can close your eyes and doze off. I know, because when I first attended this one, that's exactly what I did. So did many of my immediate colleagues actually, so I don't doubt only few of you are actually interested in what I have to say. I will say it nonetheless, because even if you only catch a few words in your sleep-addled moments, I am sure they will be beneficial in your future work for the Foundation. As you may not know, the seed of GRU-P was planted by a small gathering of suitably open-minded men under Stalin, to investigate the murder of prominent Bolshevik leader Kirov. The history books will tell you Kirov was simply shot and killed, but Stalin knew better. I refer of course to the fact that Kirov was murdered using an construct-invasive reality discrepancy similar to the one found in iterations of SCP-███. Dr. Gerhard, you will know what I'm talking about. Don't think I didn't see your eyes pop open there, Rainier. What they found during the investigation gave Stalin enough to feed his paranoia, and the Abnormal Occurences Commission was allowed to expand its work. Anyway, having carried out Stalin's inquest, their attention soon turned to the possible exploitation of anomalous means for the benefit of the motherland. Let's just say that they found enough to exploit. Once the Soviets realized the capitalist nations were far ahead of them in para-natural research, with special consideration given to a vast gulf between them and Nazi Germany, GRU-P became the institution designed to fill this gap. Now, you might have gleaned some of this from the Foundation's internal documentation on the group What that won't tell you though is the extent of damage GRU-P's activities have done to this reality construct. I'll simply say this: during the second world war, hundreds of thousands of bombs fell on occupied Europe. Many of them didn't explode, and to this day people find unexploded armed ordnance in their backyards. If we translate this to GRU-P, we need to add the fact that this ordnance can have razor sharp teeth, be able to teleport instantly, phase in and out of existence, end the world by a twinkle in its eye. Fact of the matter is we have no idea how many projects the Russians had going at any one time, and we have no way of knowing where it all went. When that wall came down, GRU-P vanished and most of its files, personnel and anomalies went with it. This isn't to say the threat is gone. While no longer backed by a superpower, we know that many persons associated with the defunct GRU-P continue to collaborate, in many cases preserving and continuing their work from before the fall of the iron curtain. Similar to the collapse of Prometheus Labs, they are not to be considered a relic of the past. That, ladies and gentlemen is why you should be far more knowledgeable and even more importantly, far, far more concerned about GRU Division "P" than you probably are right now. We have a small selection of projects dealing with their interests, as most of you will know, but we have no real clue how much we're still missing. Those of you who have paid attention can come to me afterwards for more information on what we know is out there. Those of you who either didn't hear or don't care: I hope that you never have the misfortune of finding out just how right I am. (1) Division "P" GRU shares overall aims with its superorganization as per order of the Head Commitee of GRU nr. 13/1965 - these include discovering, obtaining or neutralizing foreign technologic developments that could endanger USSR and broadly, the states of the Socialist International, their citizenry, or its overall political, economic, military and scientific aims. 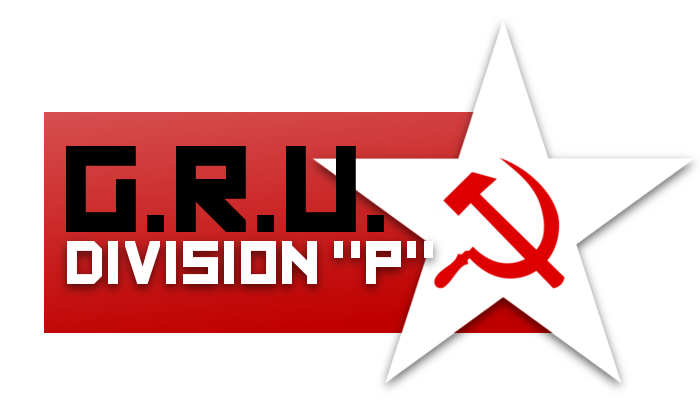 The activity of "P" division GRU is aimed at suppressing hostile abnormal activities, within the states of the Socialist International, documenting abnormal phenomena, and researching means of their use in furthering the overall aims of the organization. (a) Gathering intelligence data in designated countries of interest regarding the aims, means and procedure of governments, groups, organizations or individuals hostile towards USSR or otherwise deemed dangerous, specifically where these possess or exploit abnormal means as defined in order of Fourth Department Abnormal Occurrences Commission chairman nr. 19/1938 "Classification of abnormal activity". (b) Checking, analyzing and processing information regarding abnormal occurrences within and without USSR territory. (i) Neutralizing or containing hostile abnormal occurrences within USSR territory. (ii) Researching abnormal occurrences within USSR territory aiming to improve the efficiency and security of the procedures enacted in order to neutralize or contain them. (iii) Researching abnormal occurrences within and without USSR territory in order to bring about their exploitation and use to further organizational goals. (iv) Identifying and obtaining access to abnormal phenomenon with a high estimated economic, military, scientific or political value, especially if in possession of hostile organizations or individuals. (v) Identifying and recruiting or eliminating individuals with knowledge of abnormal occurrences where such is suitable with regards to overall organizational aims. (i) Cooperation with the Institute of Experimental Marxism-Leninism aimed at furthering political developments within the world so as to further the social advancement towards the establishment of a communist society. (e) Enacting cooperation with allied organizations outside USSR, chiefly national intelligence organizations' departments concerned with abnormal occurrences of allied states, and psychotronics research organizations of allied states. "BULAVA" - The Horizon Initiative. Organizational aims directed towards furthering theocratic agenda at direct odds with the geopolitical interests of USSR and allied states. Dispones with significant amount of abnormal means generally styled as "holy relics" or otherwise tied to the specific ideological precepts of the group - often at odds with their genuine origin. "ALARIC" - SS Ahnenerbe. Organizational aims directed towards furthering the politics of the Third Reich and its geopolitical aims through use of abnormal means. Extinct. See document "WOLFSKIN". "GOSPLAN" - The Factory. Organizational aims are directed towards manufacture and distribution of supernatural objects to the larger population. Irregularly active, appears to be more focused on reaching the consumer culture of the First World. "BOREI" - The Fifth Church. Organizational aims appear to dispersed and non-centralized. Ideologically tied to concepts with space travel and the larger universe. Cosmonaut training includes screening for persons associated with these beliefs. "CALDERA" - Global Occult Coalition. Established as a multinational organization under the shield of the UN. Organizational aims directed towards eliminating abnormal occurrences throughout UN membership countries, with tacit sub-goals of furthering Western geopolitical aims. "ENGELS" - Lomonosov-Makarenko Institute for Scientific and Political Education. Organizational aims directed towards furthering the economic, ideological and political development of the USSR through abnormal means applied often in unconventional and highly risky manner. Sporadic activity. Operates from unknown location from within USSR territory; the self-reported location of Bolshoi Chemodansk, Soviet Socialist Republic of Kalpakstan does not exist. Widely believed to be due to a lone gunman, possibly orchestrated by Stalin to initiate his great purge. A long gunman walks right past Soviet security and fires a fatal shot, questions are going to be raised. A great incident to world history, a benign one to the world of the anomalous. However, nothing could be further from the truth. This was the first thread pulled to reveal the great tapestry of the paranormal to the Soviet Union. Of course, it is also true that this precipitated prescription on a scale not seen since the days of Rome. Stalin was, after all, a master of wheels within wheels. The GRU expand the recently inaugurated Division "P", the Soviet answer to the West's second enlightenment, the discovery that nature could be bent past broken, the jagged edges being quite useful for cutting the throats of your enemies. GRU-P is known to have considered government change within the Soviet Union, the exact parameters, success, and veracity of this report have not been confirmed. GRU-P agents are attempting to document any possible anomalous entities residing within their borders after an incident in Germany caused unexpected anomalous phenomenon to begin manifesting itself. Citizens of the Soviet Union with anomalous properties are aggressively recruited by GRU-P for the purpose of espionage. It is known that many of the most serious breaches in information security were related to this program. Anomalous materials continue to be used in furthering Soviet industrial practices, indicating that GRU-P has taken a larger role in furthering Soviet economic practices. As a nuclear power, graduated from global crisis between the superpowers, GRU-P is known to contain anomalous phenomenon at a much larger scale. Organizations like the GOC, UIU and SCP Foundation can no longer treat them as a second-class player, their secrecy has proved to be hiding strength and not weakness. GRU-P finances and activity become increasingly difficult to track, as their ability to self-finance through anomalous means becomes a matter of speculation outside the Soviet bloc. Large-scale infiltration of the West by GRU-P has occurred at a scale not predicted by any of the major powers. Consequentially, every operational Foundation site and outpost should be issued with revised guidelines for dealing with GRU-P agents and anomalies. Espionage activities in Western nations continues, with attempts to manipulate public opinion becoming more bold as GRU-P appears to grow more self-confident. All known activity related to the institution named GRU Division "P" ceases as the larger GRU organization is abolished by most post-Soviet states. A rose by any other name, however, can still be as sharp. As it turns out, comrade Mitrochov here has found where it has its origin, the supposed miracle the scheming traitors gave to the perpetrator, and that he lost on his way out. In a village near Leningrad, where a rumor goes about, that a shot White Guard holding the little pewter cross somehow sneaked right past a platoon of our troops and seized the machine gun behind them, killing a dozen before a grenade took him down. Turns out someone has dug out where he and a number other Whites were buried some months before comrade Kirov's life was taken, on NKVD orders. What is more, our comrades in the Commission have investigated dozens of other such rumors and tell-tales, and at least in two others, have found things that can not be brushed under the carpet either. Comrades, all of us here are bearers of a scientific, atheistic worldview, and as such would be quick to see folk tales and rumors of the sort as mere superstition stemming from a lack of knowledge and a priest's fairy-tale worldview. Still, time to time such superstition sticks to something that is genuine, and to dismiss that would be the act of not a materialist, but a know-it-all with a worldview so rigid it can hardly be called scientific. After all, our great grandfathers would say it was Lord God who made rain fall and lightning strike, but while a Leninist knows they were wrong, he still could do better than stick his arse towards the sky in a thunderstorm, for it makes them no less real. No, comrades, the work of the Abnormal Occurrences Commission shall continue - from now on it shall look at things taking place which by all reason should not have, all over the Union, and with full support of the Politbyro and the Fourth department behind it. Most of such will likely prove to be empty rumors and nonsense, but even one needle in a haystack can kill a horse. And when their diligent efforts bring understanding, we shall make use of this understanding to deal many a blow to the enemies of Soviet people, in a manner they would never have dreamed of. I leave you with the saying of our dear comrade, academician Michurin - "We cannot wait for favors from Nature. To take them from it – that is our task."